There’s a theme with the Lenovo updates being announced today: in most cases, the new models are similar to the previous generation, only now with Intel’s Broadwell-U processors in place of Haswell-U. 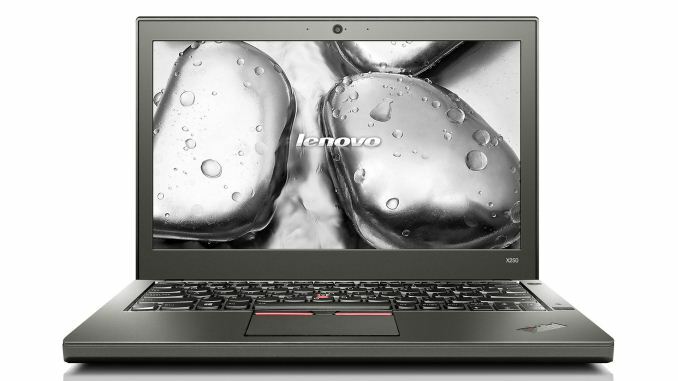 The ThinkPad X250 continues that trend, supporting up to Core i7 Broadwell-U processors. Of course the big draw of the X250 is that it boasts more battery life than any other laptop I know of with the same battery capacity. Equipped with the 72Wh 6-cell battery (in addition to the built-in 3-cell 23.2Wh battery), the X250 is rated at up to 20 hours of battery life. As with the X1 Carbon, that’s a nice increase compared to the previous model that was rated at 17.4 hours. The touchpad has also returned to the previous design, with dedicated left/right buttons at the top (for use with the TrackPoint), which is sure to please many that disliked the changes made with the X240. Screen options are the same as before: 1366x768, 1366x768 Premium IPS, or FullHD IPS. Memory still comes courtesy of a single SO-DIMM slot (8GB max), storage options consist of up to 512GB SSD or 1TB HDD, and the weight and dimensions appear to be unchanged as well. Pricing and availability have not been announced but the X250 should occupy the same MSRP bracket as the X240 (which is now on sale). Yeah they should do what HP does with their Elitebooks and build 4GB or 8GB on-board, with an empty SODIMM slot for the end-user. The real irony is that from Haswell onwards (X240,T440), Lenovo have mostly gone with a single SODIMM and hence single channel. Since Haswell also introduced a max of 15W CPUs, this has meant that not only did the CPU performance go down vs the Ivy Bridge generation (X230 / T430), but with single channel the one advantage that Haswell *should* bring (better GPU performance) is absent. HP went for dual SODIMM slots in all except for the 11.6" 1.33KG 810 which makes a lot more sense. Pity about the Elitebooks cursor key arrangement as I really do not like the layout. This so much. The ultrathin craze is out of hand. Everything is coming soldered at the bare minimums. I have a Folio 1040 and I was happy that I would be able to upgrade the RAM if I needed it, but apparently HP has, for this laptop, some strange single-sided RAM chips that I've never even seen used before anywhere, and two-sided ones don't fit. They're unavailable except for the HP store where they are quite expensive.